YouTube is aiming to demystify 360 video by giving creators the tools to see just what parts of the video caught the viewers’ attention. Announced over the weekend, YouTube will now give users heat maps that indicate which direction viewers spent the most time at, accessible on any videos with over 1,000 views. The feature gives YouTube channels an idea of which part of the 360 video was most engaging. It places a color heatmap overlay on the video, showing areas of low attention in blue and high attention in red. 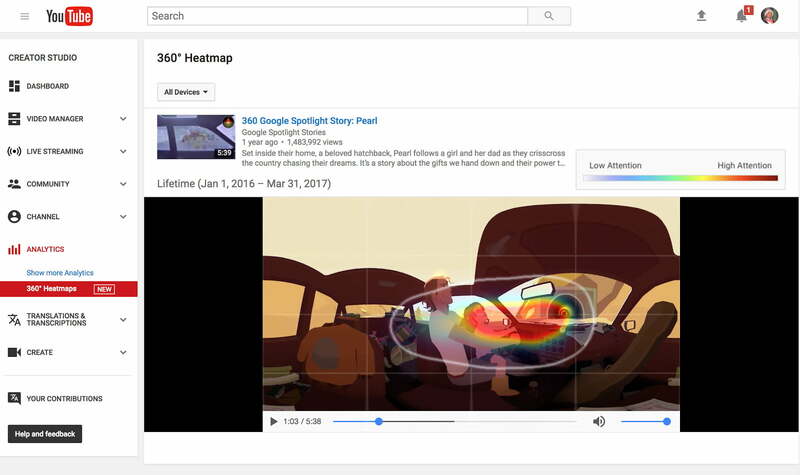 “With heatmaps, you’ll be able to see exactly what parts of your video are catching a viewer’s attention and how long they’re looking at a specific part of the video,” Frank Rodriguez, YouTube Product Manager, shared in a blog post. While the feature is designed to help video creators increase engagement, YouTube has already uncovered a few trends using the new feature. According to YouTube, viewers spend 75 percent of the time looking in the front 90 degrees of a 360 video, suggesting that, despite the immersive format, the direction you orient the camera in matters. The numbers are a bit different when considering just the most popular 360 videos, the video-streaming platform suggests. For these videos, 20 percent of viewers spend a significant time exploring the space behind the camera, or directly opposite the original view when that video first loads. 360 cameras are best used when there is a reason to show the entire view. “The more engaging the full scene is, the more likely viewers will want to explore the full 360-degree view,” YouTube says. The new data tool also offers insight based on how viewers are exploring the video. Desktop users tend to jump right into the experience, while users with Google Cardboard need a few seconds to “get situated” in the scene, suggesting some videographers may not want to jump into the action from the very first frame. With the new 360 heatmap feature, YouTube also announced the VR Creator Lab, a sort of 360 boot camp that leads videographers through a workshop and helps get VR projects off the ground.